Above is the before picture, showing where I am taping off the guitar for exposure. As you can see, the top board is way lighter than the bottom. Like most guitars, this one is a two piece body. Unlike more expensive guitars, it isn't bookmatched so the tone of the two boards is identical. The solution is to try to darken the lighter wood by masking off the rest of the guitar, and then exposing it to the SG-1 lamps. For this test, I'm using a very old set of lamps (technically, they have 2000 hours on them so are past time to replace) and we are running them in VHO mode, around 80 watts each, double the power of a standard lamp of this size. We are using high frequency ballasts, so really this is closer to running a 100w standard ballast on them. No matter how you calculate it, it is a ton of power, and it definitely puts out some heat. I'm running the guitar just a few inches away from these lamps and it does get rather warm to the touch, but not a problem. After two days (as of Wednesday, 4-27-16) there is a definite difference in tone. We are probably 40%-50% there color wise. Keep in mind, I'm shooting through a thick layer of finish that is filtering out the UV in a tremendous way. If this was bare wood or just sealed wood, we would probably be done by now. I don't expect to get a perfect match, I'm just trying to make it less noticeable. The guitar is used and has a few little dings on the front, but it has an arched burled walnut top with walnut binding, so it is worth making a bit prettier. My guess is that it is a Samick body, one of their high end ones, setup for Gibson style bridge and two humbuckers. Nice wood, worth the effort. This will be a simple test, I will just age it down and show you the after. Again, I don't expect a perfect match, just something closer than where we started. This should be a good example for carpenters who are trying to match new cabinetry to old, where the old has faded due to sun or environment exposure and the new is too light and has no fade. We sell lots of SG-1 lamps and Universal UV lamps for this very purpose. Of the two, the SG-1 (any size) is the better choice. Here is the after shot, a week of exposure at VHO mode but on really expired lamps, so comparable to HO mode for 5 days, I guess. Plus we are shooting through a UV blocking finish, so only a small fraction of the UV is getting though. Do it long enough, however, and it adds up. They don't match perfectly, but nothing you do will ever make them perfectly match. 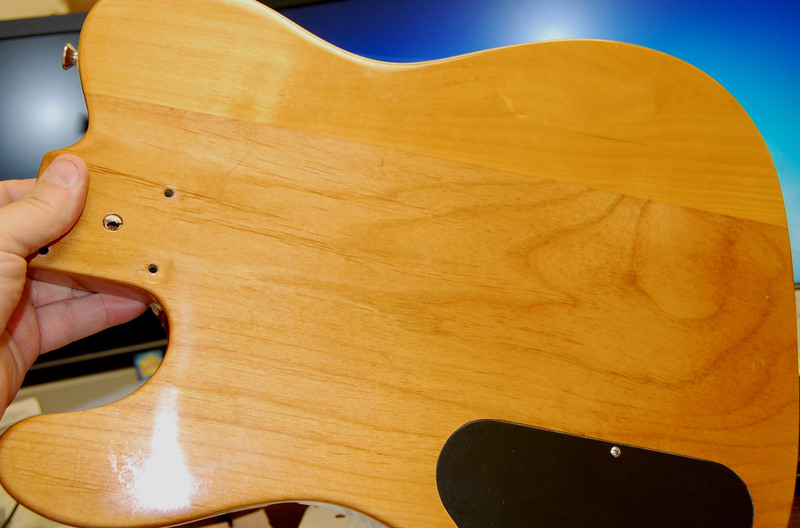 It is a Samick body, they didn't bookmatch the wood, so these boards are from different trees. The goal was to reduce the contrast between the guitar halves, and I think we got that accomplished. I'm pretty sure I could age it another week and get closer but I don't see a need. Above all, this shows you can take new cabinetry and make it match old cabinetry. The finish on a cabinet is a fraction of the thickness used on guitars, which typically have 1/8" thick finish for some unknown reason. This was the worst case scenario in every way, but it worked. If you are trying to match old and new wood, the SG-1 lamps will work perfectly every time.